I love watching movies. In the US, I also really enjoyed the lead-up to a movie night at a theater: You queue up at the ticket window, hoping that the movie you want at the time you want isn’t yet sold out. You finally get to the ticket window, and you ask for a ticket for the show you want. You hand over your credit card and your frequent viewer membership card, and then you wait. Sometimes you arrive early so you go and have dinner with your friends. If it’s a big big showing (like the Harry Potter movies or the Lord of the Ring trilogy was), you probably want to get in line right away, even if you are hours away from show time.Most movie theaters worth their salt are smart and set up a queuing system when they know that the show will be big and there will be a line. The AMC Theater I used to go to definitely was good about that. The thing is, unless you are first in line, you are not guaranteed a good seat at all. If it’s a new and unfamiliar theater, you might end up on the wrong side of the theater. You might need to take a potty break before settling in for a 2 hour and 45 minute thriller. And you might still be sweating from the mad rush after they let everyone in. That was the routine. And in cases where dinner took too long, or your friends arrived late and you have to wait for them because you have their tickets, it can really cause a lot of stress since you have no idea if your seat will be any good. Here in Sweden, they have a system that is SO easy and yet so good. They have reserved seating, almost like when you buy a ticket for a plane. You pick the seats you want and that’s it – no extra fees involved. Certain theaters even have “Plus” seating – a much bigger seat and more legroom. You do pay 20 SEK more for those (about 3 bucks), but they are free to reserve too. Show up 20 minutes after the start time and you’re almost guaranteed to miss all the advertising and previews and get settled right as the movie starts. Or, you can show up a little bit before the movie, buy your drinks and snacks, casually go into the theater, and find your seat. Whatever the case, there’s no stress. You KNEW what seat you’re going to sit in so there’s no mad rush to get into the theater. This is such a simple and GREAT idea that I’ve truly come to appreciate. I know there are some theaters in the US that have this concept, but they go all out and make it a “premium experience” where you actually can order food and drinks seatside. I don’t need that – I prefer to eat at a restaurant anyway, where I can see and talk to my friends – I just want reserved seating. Are there any US theaters that are piloting this process? Perhaps they can start with reserving a section in the theater for their frequent guests, which each seat can be reserved. That would be a great way to encourage people to use their frequent viewer cards, which I know companies like because it gives them valuable information about their customers. This entry was posted in Success, TrulySwedish on August 18, 2012 by Kenneth Chen. Completely agree- I love it! 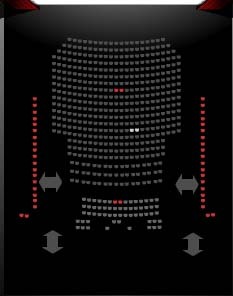 The Landmark in Los Angeles has reserved seating. Pretty much all of the theatres in Los Angeles have had this for a few years. I can’t remember the last time I went to a movie without reserving a seat. It’s pretty much standard here now and is not considered “premium” at all.